Meet Major the Bull. He stands in the middle of the public square in Downtown Durham. I lived and worked in Durham for 18 years. 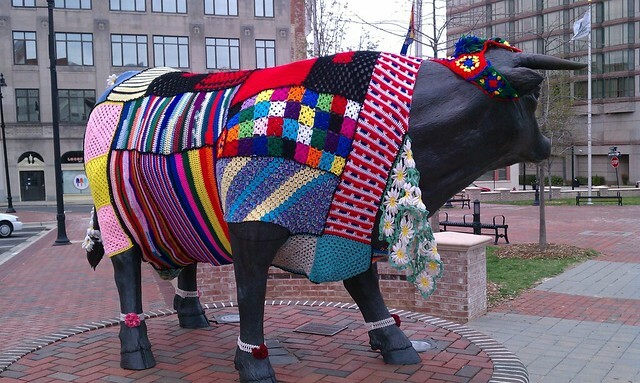 I was visiting recently on my birthday at the time that Major was adorned in this spring outfit by Off the Hook Crochet Guild. I love it! Major was cast at Liberty Arts, a foundry in downtown Durham, and modeled after the Bull Durham Tobacco mascot, which is also the stadium mascot for the Durham Bulls minor league baseball. If you saw the movie Bull Durham you might remember seeing Major's eyes light up and smoke coming out of his nostrils every time a member of the team hit a home run. Major is showing his feminine side here. Isn't it sweet!